Coni is an expressionist landscape painter. A life-long artist, Coni spent 20 years as a professional designer in San Francisco and Los Angeles before turning to full time painting. She uses her design background and Expressionist influences, coupled with innovative color ideas, to express a distinctive view of the landscape. Though primarily a plein air (outdoor) painter, when temps drop below freezing she heads for the studio to work on larger pieces developed from her studies and sketches. 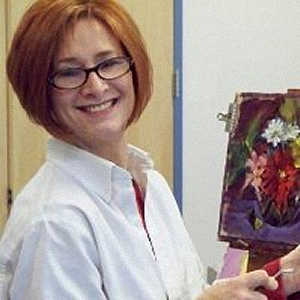 Coni is an active member of Plein Air Artists Colorado (PAAC), Plein Air Painters New Mexico (PAPNM), Spanish Peaks Arts Council, a founding member of High Desert Painters - an international plein air group, and founder of the San Luis Valley Painters. She has painted all over the western United States and Canada, and her work is in collections, both public and private in the U.S and abroad. Coni has a B.F.A. in Graphic Design from Cal State University Long Beach and an M.A. in Painting from Adams State University in Alamosa, Colorado, where she lives with her family, paints and teaches painting year around. "Nature has always influenced my outlook on life and capturing it en plein air is what I love. Painting outside is its own reward - part meditation, part athletic event - it is never less than an adventure. I have been inspired by painters of the American West and Canada, where plein air work has a great tradition, but also by the expressionist painters of the early 20th century. Any day painting out is a good day."